Hello again! I decided to apply for a CAS (clean and simple) DT (design team) challenge position on Splitcoast. The DT makes a card every week to fit that week's challenge. For the DT call we were to make cards based on 3 challenges. My first card was a sketch challenge based off of my ornament card found here. 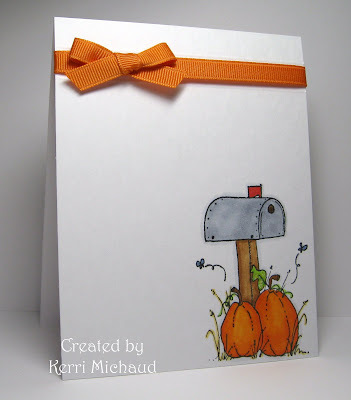 I was soooo honored that Jen (Miss Boo on SCS) chose my card as her inspiration!!! I decided to use this adorable Whipper Snapper image. I colored it with Copics and added the score lines and ribbon just like on my original card. 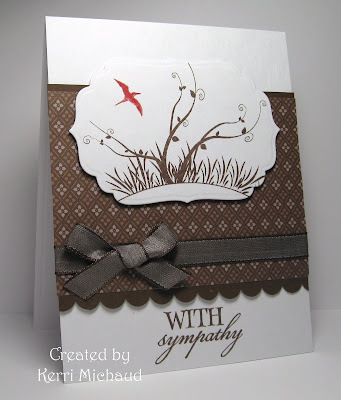 The second challenge was to make a monochromatic brown card with a small pop of red. I used this beautiful image from Verve's Forever in Our Hearts. I inked it up with Chocolate Chip, removed the ink from the bird and colored it in with a Real Red Stampin' Write Marker. The dp is Chocolate Chip DSP and the ribbon is Chocolate Chip Taffeta Ribbon all from SU. 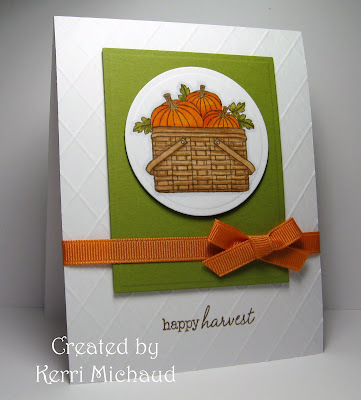 The third and final challenge was to make a fall card. I pulled out my PTI Vintage Picnic set and stamped the basket the right way this time lol! I filled my basket with these lovely pumpkins and colored with Copics. I stamped the sentiment with Memento Rich Cocoa and then added the lattice texture using my Scor-Pal. There you have it! Three CAS cards : ) Thank you so much for stopping by, again! I am sure they will be very lucky and happy to have you in their DT, Kerri! You are very very talented! And your cards are a real inspiration for others! Wonderful cards and good luck my dear!!! If they don't pick you, they're crazy....These are all beautiful, Kerri!! You do CAS beautifully!! Hmmm...for some reason I don't see you making CAS cards for a living.... - - but, any DT would be very fortunate to have you on it for sure; good luck! BTW - I love all the neat things you do with your Scor-Pal (as mine collects dust under my craft table). WOW Kerri these are fabulous!! Wish you much luck, GREAT CAS cards girl! These are awesome! Perfect samples for CAS... Good luck!!! The first one is so crisp and simple, just perfect! Love the colors in that second one...that red bird really makes it pop. And your third card is very nicely colored...those stamps are great...love the embossed bg, and another perfect ribbon! Well done on all of them and best wishes for that DT position! You are very talented and they would be lucky to have you on the team! CAS cards are my favorite but are sometimes hard to pull off without looking plain--you did a fabulous job! Good luck! These are so awesome! I loved it when I saw that the card sketch was based on one of your cards! So cool. I can't pick a favorite of these cards, because I think they are all fantastic. That picnic basket really is awesome! Good luck! These are fabulous! I love the first card with the image on the corner. The monochromatic is so peaceful. And how cute to combine a circle on a rectangle for the third card. I may have to case that idea! These are great! And aren't they easier than spending hours on elaborate ones?! I think you'd make an awesome dt member.